Moving from a home that you’ve possibly lived in for decades to a senior living community can be a big transition. Having a solid plan in place early is the key to a smooth, low-stress move-in day. 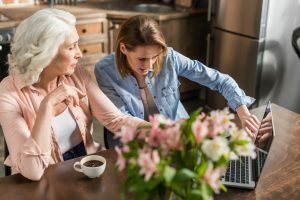 For caregivers and family members who are assisting older adults with this transition, it’s important to recognize that this is a significant life transition. Extra patience and willingness to listen can go a long way to helping your loved one feel relaxed and secure in their new home. Consider how you might consolidate personal items so that you’ll have less to move. For example, seniors who love to read might consider investing in an e-reader and donating most of their book collection to their favorite public library. Sort through and get rid of unused toiletries and makeup, donate any clothing and shoes that haven’t been worn in the past two years and try to pare down knick-knacks for a fresh, uncluttered start. At senior communities like Lighthouse, residents are encouraged to make their apartment their home – warm, welcoming and personalized. In addition to favorite items from home, consider adding a couple of new pieces such as a comforter set or colorful toss pillows. Or, create a cozy reading nook with a comfortable chair, side table and lamp. A space that is warm inviting will quickly feel like home. One of the biggest benefits of living at Lighthouse is being part of a vibrant community. Attending a couple of events each week is useful for getting to know neighbors. Family members are invited to visit often, particularly just after move-in, so they, too, can familiarize themselves with the community and get to know residents, their families and our team. With any new living situation, there’s bound to be a short adjustment period. To learn more about how joining a senior living community could benefit you or your loved one, visit our resources page or contact us to schedule a tour.